Jean-Pierre Zanardi, a gallery owner on the Left Bank, is a free spirit. Paulina Homs, a woman living a peaceful family life in Barcelona, comes to Paris for her cousin’s wedding. As if fate had planned it, Jean-Pierre and Paulina fall for each other unexpectedly, in a love affair that will shake up their lives forever. 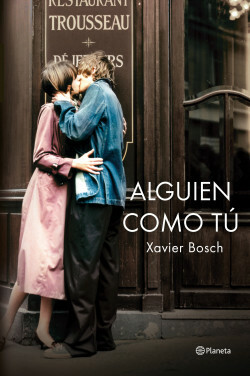 Algú com tu is the chronicle of the researching and piecing together of the love story between Paulina Homs and Jean-Pierre Zanardi, through documents, memories, sudden discoveries and the testimony of the people who were privy to the couple’s clandestine romance. It is Paulina’s daughter, Gina, many years after her mother’s death, who finds out about the great love that changed Paulina for the rest of her life. Through the letters Paulina and Jean-Pierre wrote to each other, Gina reconstructs their love story: four intense days kept alive by the strength of memory. Finally, Gina is able put together unrelated events and discover her mother’s secret and the depths of her love. A novel about the undying strength of love. A hymn to love and the power of memory, and a poignant homage to books and bookstores. Colibri (Bulgaria), Robert Laffont (France), Thiele Verlag (Germany), Sperling & Kupfer (Italy), Marcdor (Portugal), Laguna (Serbia).